July, a month in which rainfall has been 72 percent down on normal levels. Lake Bracciano, about 30 km (19 miles) north of Rome drying up. The city must fix its ancient, decayed and ruptured pipes, which leak about 40 percent of the water they carry. Rome narrowly avoided water rationing on Friday after a deal between the regional government and the city's water company defused a row over drawing water from a drought-affected lake. Taps had been due to run dry for 1.5 million Romans for up to eight hours a day from Monday, and Mayor Virginia Raggi urged the central government to intervene. Authorities had banned utility firm from drawing water from nearby Lake Bracciano, which is running low following weeks of minimal rainfall and unusually high temperatures. But a new, late order allowed the company to keep drawing from the lake, which provides about 8 percent of the city's water, at progressively reduced quantities that must be completely phased out by Sept. 1. "We avoided 1.5 million people ending up without water. It is good news for everyone! But we will not let our guard down," Raggi, a member of the anti-establishment 5-Star Movement, wrote on Twitter. Rome's water woes have taken on a political edge, with Raggi's opponents accusing city hall - the biggest shareholder in ACEA - of ignoring the building drought crisis. Nicola Zingaretti, the president of the Lazio region around Rome, said Raggi had avoided responsibility. 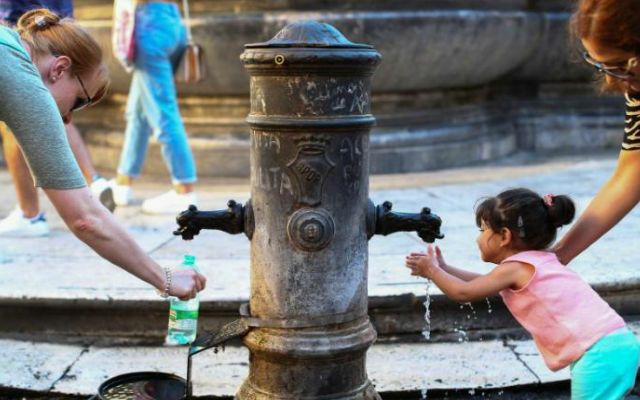 By keeping water running in one of Europe's most popular tourist cities, Rome had avoided "making a dreadful impression internationally", Environment Minister Gian Luca Galletti said. But now, he said, the city must fix its decayed and ruptured pipes, which leak about 40 percent of the water they carry. "We cannot waste any more time." Even though rationing has been averted, the government could still consider declaring a state of emergency for the area, in response to a direct request from Raggi, Galletti added. Wildfires have torn across parts of southern Italy and reached Rome's coastal fringe earlier in July, a month in which rainfall has been 72 percent down on normal levels, according to Sky Italia's weather TV channel. Lake Bracciano, about 30 km (19 miles) north of Rome, has dropped by about one meter, revealing dry sand spits. The government has already declared a state of emergency because of drought in the northern provinces of Parma and Piacenza, freeing up 8.65 million euros ($10 million) to buy drinking water tanks and invest in infrastructure.